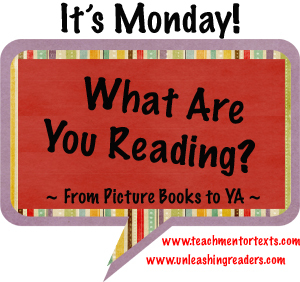 Head over to www.teachmentortexts.com and www.unleashingreaders.com for more posts. 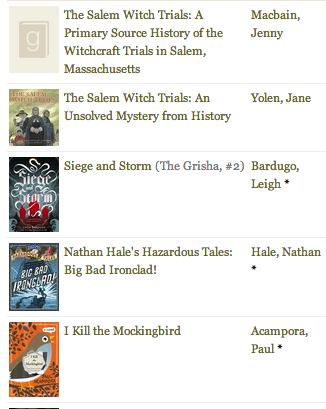 One of my students chose to research the Salem Witch Trials, so I grabbed a few books from my local library. This first one was a solid overview with some interesting source material. Jane Yolen is a master, and I love this series of unsolved mysteries. Awesome series! I'm so glad I'm all caught up now for the newest title. Not quite as fun as the first, but a worth addition to the humorous history graphic novel collection. It made me laugh - a lot. A trio of book loving friends form a group of "literary saboteurs". The bookish humor is amazing. The lessons are great. The friendship - and a touch of romance - rang true. Read it for all the great book references because it's worth it even just for that! 1) Their teacher called himself "fat Bob" - but fat jokes (though they were limited) make me cringe a bit. 2) Will it feel dated quickly? Lots of specific tech references to twitter and Instagram sound cool now - I just hope it doesn't keep kids from enjoying in a few years.